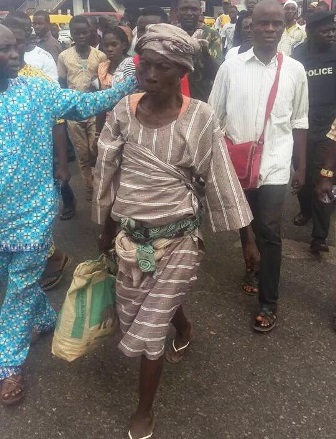 Earlier today, reports went viral of an old woman caught in Oshodi, Lagos with a dead baby ..She was alleged to be a kidnapper .She has now been released,according to the Nation. The woman, identified as Kuburat Ayinde was intercepted on Monday afternoon at Oshodi under bridge by road users and accused her of kidnapping a-month-old baby strapped on her back. Upon discovering that the child was dead, the mob descended on the woman who was eventually rescued by some of the policemen at Oshodi. It was gathered that the detectives interrogated the woman and she claimed that the dead baby was her grandchild. A police source said that the woman disclosed that she was rushing the child to the hospital passing on, adding that the child’s mother was mentally unstable. It was gathered that the woman was detained by the police to carryout investigation to ascertain her claims. According to the command’s spokesperson, Dolapo Badmos, a Superintendent of Police (SP) the woman was eventually released after the child’s mother and other family members came to the station and corroborated her story.